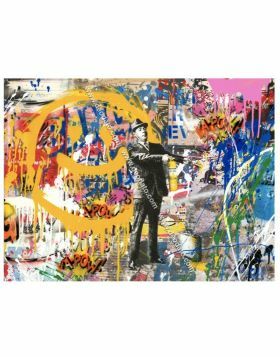 How much the works of Mr Brainwash worth? 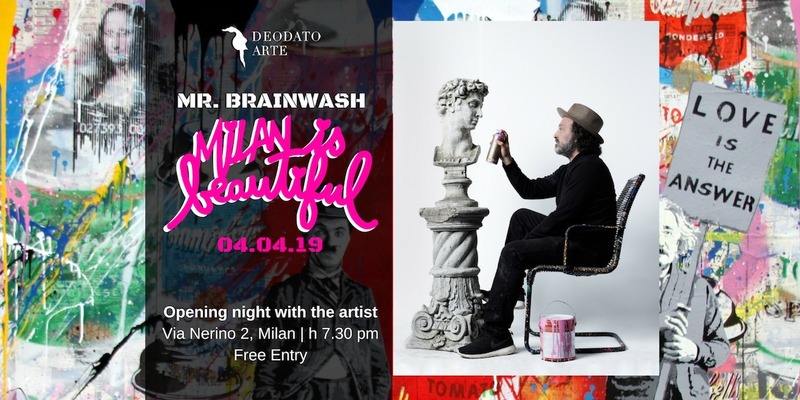 Who is Mr Brainwash? His real name is Thierry Guetta, born in Garges-lès-Gonesse in France. At the age of 15 he moved with his family in Los Angeles, where he actually lives and works in his secret workshop. He became the owner of a vintage store. He had a passion: filming everything with his beloved camera, that he always took around his neck. The course of his life changed in 1999. He travelled to France and he found out that his cousin had a secret life: he was the famous street-artist Space Invader. It was in this way that the life of Thierry chanced completely. Thanks to his passion for camera he began filming all nights his cousin and other artists. During this period his passion for street-art increased day by day. 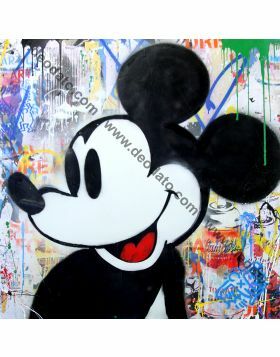 Beginning from 2008 Thierry decided to dedicate himself in the street-art scene. 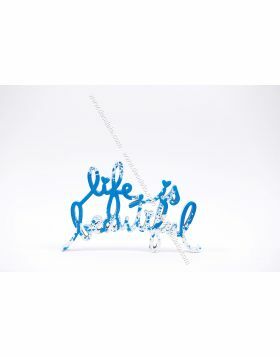 We can know more about the life of the French born artist Thierry Guetta in the documentary Exit Through The Gift Shop. The greatest street artist Banksy directed this film. All the scenes that Thierry realised with his camera compose the documentary, that was present in Sundance Film Festival in 2010. You can also admire the poster of this film at the exhibition A Visual Protest of Banksy at MUDEC in Milan. 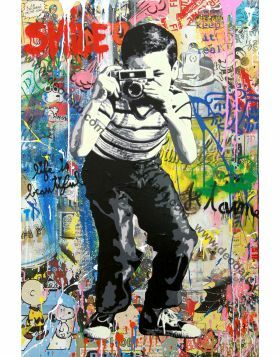 The art of Mr Brainwash is very particular. He realised his unique artworks in mixed media on a precious handmade piece of paper or on canvas. 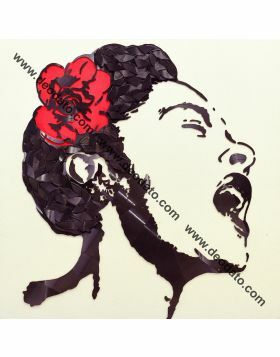 The artist uses different techniques: stencil, painting, collages, dropping. 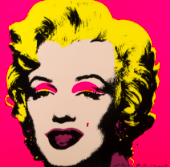 The style is that of the pop art. Very particular are the backgrounds because they are all different from each other. 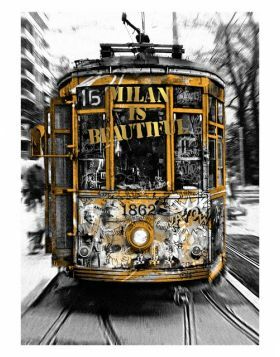 They are an explosion of colours and references of all the greatest artists and personalities of cinema, music and cartoons. We can see the famous can of Andy Warhol, the primitive men of Keith Haring, the Balloon Girl of Banksy. We can also find the famous singer Madonna and the cartoon subjects like Spiderman or Batman, and so on. 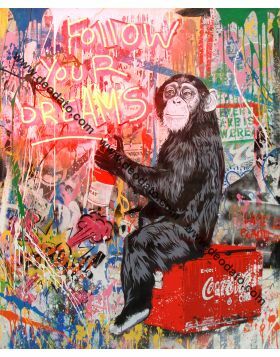 His typical most known subjects are Einstein, Chaplin, Mickey and Minnie, the children and the gorilla with the written Follow Your Dreams. All his works are unique pieces. They are all provided with the particular certificate of authenticity of the artist. After Thierry decided to dedicate himself in filming his cousin and his friends, he made lots of travels all over the world. The had the opportunity to meet lots of street artist. 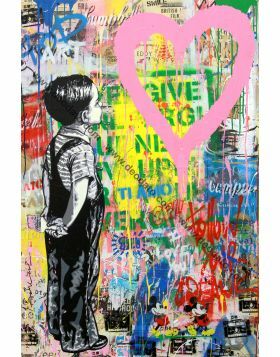 The turning point of his life was when meet the two important street-artists Shepard Farey and Banksy. He filmed their artistic creations for some years. In 2008 he decided to develop himself in creating his own art. His first exhibition took place in Los Angeles in 2008. 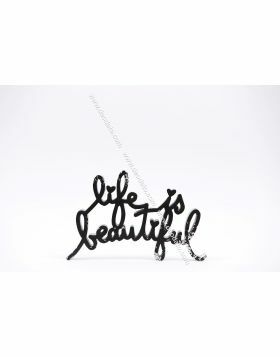 The name of the show was Life is Beautiful and it was a big success. He earned more than 1.000.000 dollars in selling his artworks. 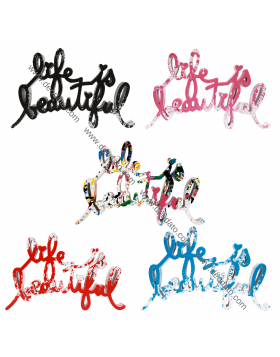 Life is Beautiful was the name of his first exhibition in Los Angeles in 2008. 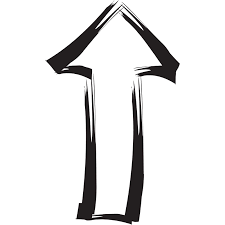 This phrase became soon his slogan. Thierry is a person always positive, smiling and cheerful. 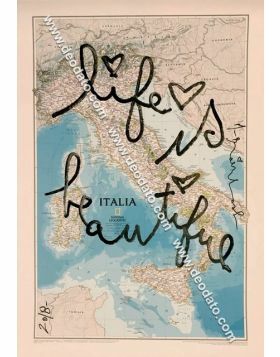 His personal purpose is to bring joy and positive messages of love through his art and works. This phrase is so important for him that he always writes it behind all his unique works. Also the subjects of his works communicate joy and happiness. 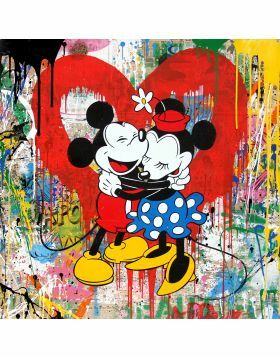 For example, he chooses the gorilla “Follow Your Dreams”, Chaplin with the heart, Einstein “Love is the answer” and the couple of Mickey and Minnie. After his exhibition in Los Angeles in 2008, he became soon one of the most important street-artist in the world. From 2009 he began to collaborate with very important singers and for the greatest hits. He realised the cover of the album “Celebration” of Madonna. He worked also with Michael Jackson, The Red Hot Chilli Peppers, the Black Keys and Rick Ross. All these collaborations contributed to increase his reputation and artist career. What is street-art? 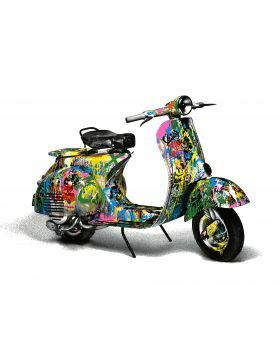 Why you should buy street-art? 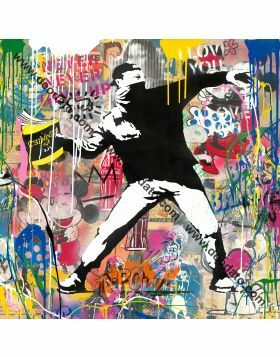 Is street-art a real investment? This are the most common questions that lots of people think when they approach for the first time the field of contemporary art. 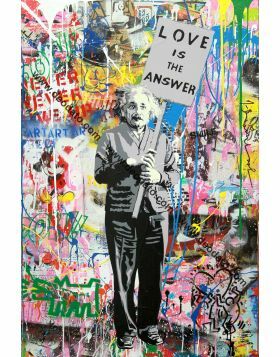 But there is also another popular question: is Mr Brainwash Banksy? 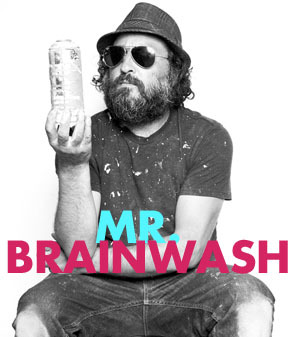 Lots of people think that under the hidden personality of Banksy there is Mr. Brainwash. 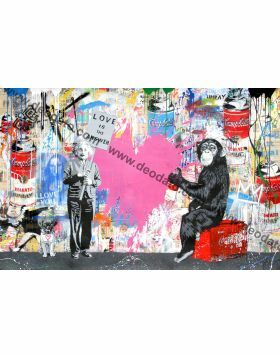 Mr Brainwash and Banksy are friends. 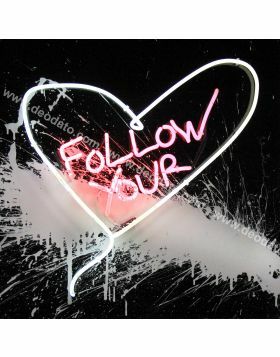 Thierry followed and filmed Banksy during the realisation of some of his works all over the world. 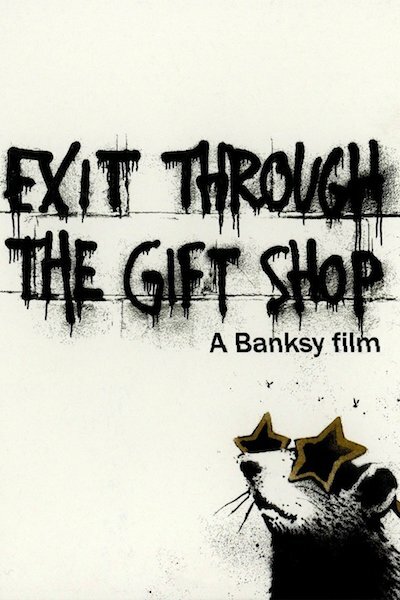 But the fact more important is that Banksy directed the documentary Exit Through The Gift Shop. 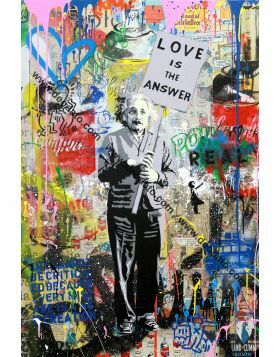 In this way he contribuited to increase Mr Brainwash popularity. 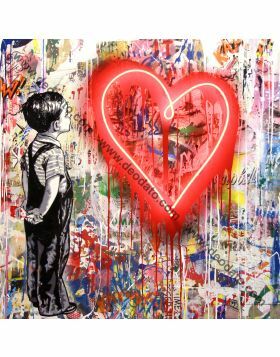 It is for this reason that Mr Brainwash dedicated some of his works to Banksy. He realised the works Banksy Thrower or the Girl with Balloon. HOW MUCH THE WORKS OF MR BRAINWAH WORTH? 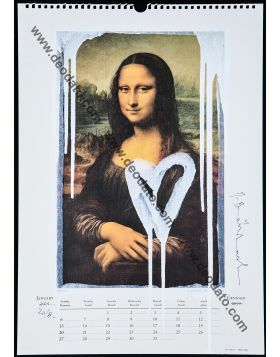 Today Mr Brainwash is one most quoted street-artist in the art market. His works are very desired in all the world and by the most important art collectors and art galleries. The prices of his works reached record quotations, tripling the estimations of auction. 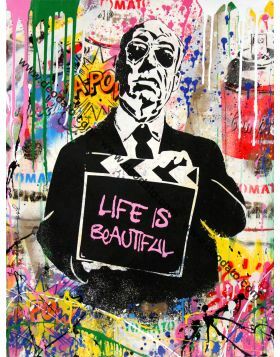 Today Mr Brainwash quotations are always growing. It is for this reason that you shouldn’t pass up the opportunity to buy one his wonderful unique work. 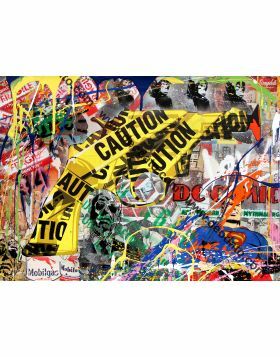 The art is Mr Brainwash is perfect for decorating your houses but it is also important if you want to invest in contemporary art. 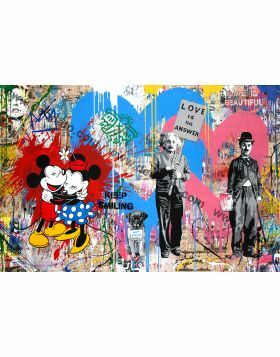 Where to buy Mr Brainwash works? 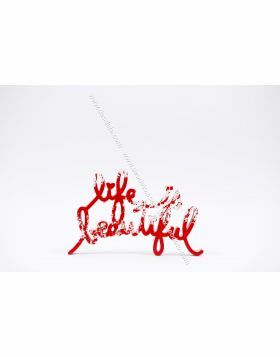 You can find it on online sale or in the most famous and exclusive art galleries. They are also present in the most important art fairs in all the world, such as Art Basel. Maybe you don't know that there is a beautiful documentary about street art and Mr Brainwash, in which is told his the story, how he became an artist and in which way he sold all his works during his first exhibition in Los Angeles. You can see it on iTunes or search it in the web. 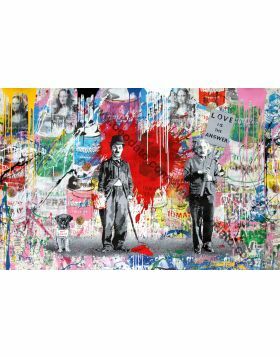 Are you hesitating to buy a work of Mr Brainwash? 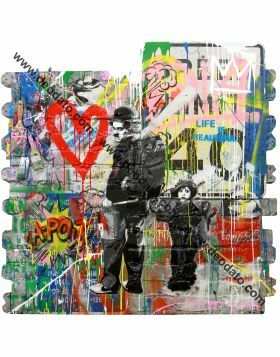 Look at the Film directed by Banksy, that told the true story of Mr Brainwash and of Street Art! We are absolutely sure that after seeing the film you will be sure if buying or not one of his works!